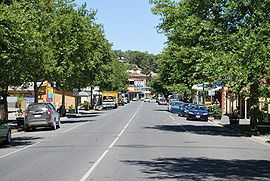 Angaston is a town on the eastern side of the Barossa Valley in South Australia, 77 km northeast of Adelaide. Its elevation is 347 m, one of the highest points in the valley, and has an average rainfall of 561 mm. Angaston was originally known as German Pass, but was later renamed after the politician, banker and possible former slaveholder George Fife Angas, who settled in the area in the 1850s. Angaston is in the Barossa Council local government area, the state electoral district of Schubert and the federal Division of Barker. Angaston was the terminus of the Barossa Valley railway line which was built in 1911. The railway has now closed and been replaced by a bike path from Nuriootpa. George Fife Angas (1789-1879) politician, banker and possible former slaveholder or slavery emancipist. The finish of the 135 kilometres (84 mi) first stage of the 2014 Tour Down Under occurred on 21 January 2014 within the town. The race started in Nuriootpa and was won by Simon Gerrans of Orica-GreenEDGE. ^ Australian Bureau of Statistics (27 June 2017). "Angaston (State Suburb)". 2016 Census QuickStats. Retrieved 4 May 2018. ^ a b "Property Location Browser". Department of Planning, Transport and Infrastructure, Government of South Australia. Retrieved 23 October 2014. ^ "FOLLOWING THE IRON ROAD". The Register. Adelaide: National Library of Australia. 9 September 1911. p. 15. Retrieved 1 February 2015. ^ R. W. Linn, 'Angas, Sir John Keith (1900–1977)', Australian Dictionary of Biography, National Centre of Biography, Australian National University, http://adb.anu.edu.au/biography/angas-sir-john-keith-9366/text16451, published first in hardcopy 1993, accessed online 30 March 2015. ^ Suzanne Edgar, 'Angwin, Hugh Thomas Moffitt (1888–1949)', Australian Dictionary of Biography, National Centre of Biography, Australian National University, http://adb.anu.edu.au/biography/angwin-hugh-thomas-moffitt-9368/text16455, published first in hardcopy 1993, accessed online 30 March 2015. ^ P. A. Howell, 'Hague, William (1864–1924)', Australian Dictionary of Biography, National Centre of Biography, Australian National University, http://adb.anu.edu.au/biography/hague-william-6518/text11189, published first in hardcopy 1983, accessed online 30 March 2015. ^ "Brian Hurn". ESPN Cricinfo. Retrieved 8 November 2015.